In a large bowl, stir together the flour and salt. In a separate bowl, whisk together the butter. sour cream, eggs, egg yolk and oil. Stir the wet ingredients into the flour until well blended. Cover the bowl with a towel, and let stand for 15 to 20 minutes. Place potatoes into a pot, and fill with enough water to cover. Bring to a boil, and cook until tender, about 15 minutes. Drain, and mash with shredded cheese and cheese sauce while still hot. Season with onion salt, salt and pepper. Set aside to cool. Separate the perogie dough into two balls. Roll out one piece at a time on a lightly floured surface until it is thin enough to work with, but not too thin so that it tears. Cut into circles using a cookie cutter, perogie cutter, or a glass. Brush a little water around the edges of the circles, and spoon some filling into the center. Fold the circles over into half-circles, and press to seal the edges. Place perogies on a cookie sheet, and freeze. Once frozen, transfer to freezer storage bags or containers. To cook perogies: Bring a large pot of lightly salted water to a boil. 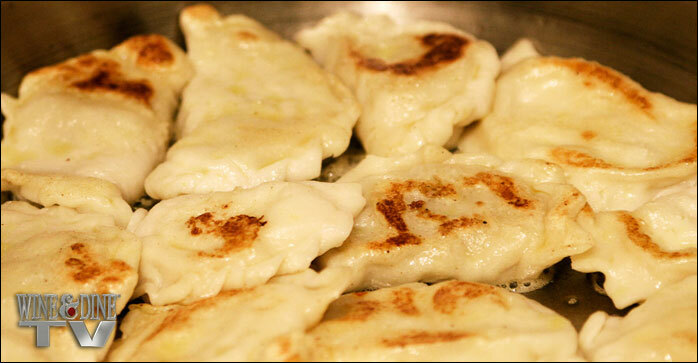 Drop perogies in one at a time. They are done when they float to the top. Do not boil too long, or they will be soggy! Remove with a slotted spoon.